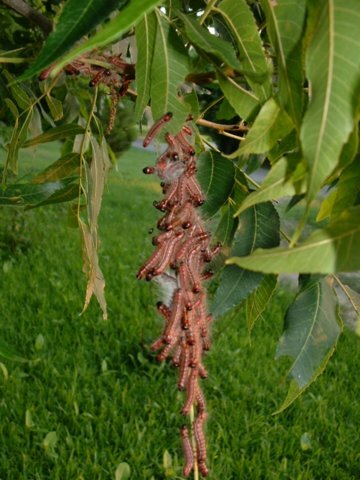 Caterpillars are worms or larvae of moths and butterflies and they eat plant foliage. They can be controlled with Bt sprays (Bacillus thuringiensis), orange oil based sprays or neem sprays. Native wasps will also help control them. The best wasps to release are the tiny trichogramma wasps. See Also: ​Armyworm, Cabbage Looper, Cankerworm, Codling Moth, Corn Earworm, Cutworm, Imported Cabbageworm, Leafroller, Puss Caterpillar, Tent Caterpillar, Tomato Hornworm, Webworm. 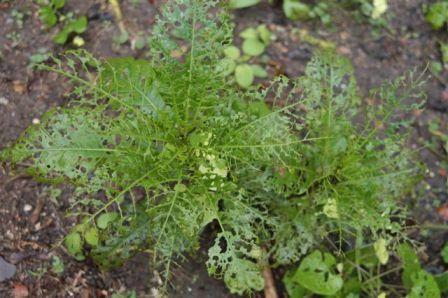 QUESTION: We have a beautiful mustard green crop that has survived the freezes of this winter. When harvesting the leaves and stems I noticed about 1/3 of the leaves have holes eaten in them, particularly the newly forming, more tender leaves. There are numerous lady bugs present, especially down in the base of plants where eaten new leaves are forming. A few aphids are on leaves with lady bugs in pursuit. Any suggestions? K.M., Irving. ANSWER: The holes may be caused by small caterpillars. If so, they can be controlled with trichogramma wasps or Bt (Bacillus thuringiensis) spray. If the pests are beetles of some kind, spray the plant oil products or the mixture we use for fire ant mound drench which is made of equal amounts of orange oil, compost tea and molasses. Mix 4 oz of this concentrate into a gallon of water. Garlic tea sprays will also help control these pests as well as help with diseases.